Red Heart has finally produced a yarn that is specifically for pooling. 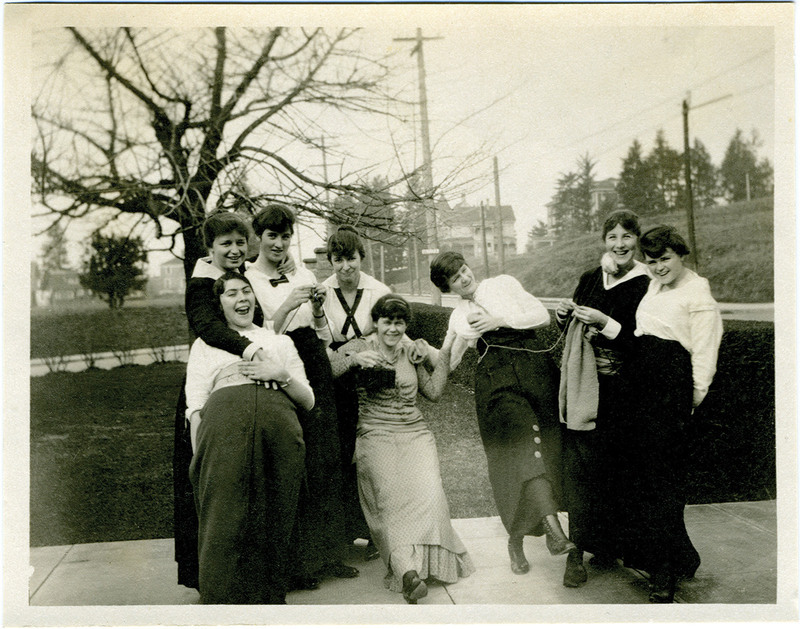 Uniformity of color is assured, “engineered so that color repeats are evenly dyed for happier pooling” – as the ad says. I was looking for this about two weeks ago when I went to Joann Crafts, but they weren’t carrying it yet. I have to call them. And yet….am I being silly when I say I don’t want it to become easy? That means there will be no craft or hard-won hours to brag about? That’s why I need to try this out. As soon as it hit the shelves on my LYS, I’m getting some, and I will report the results. 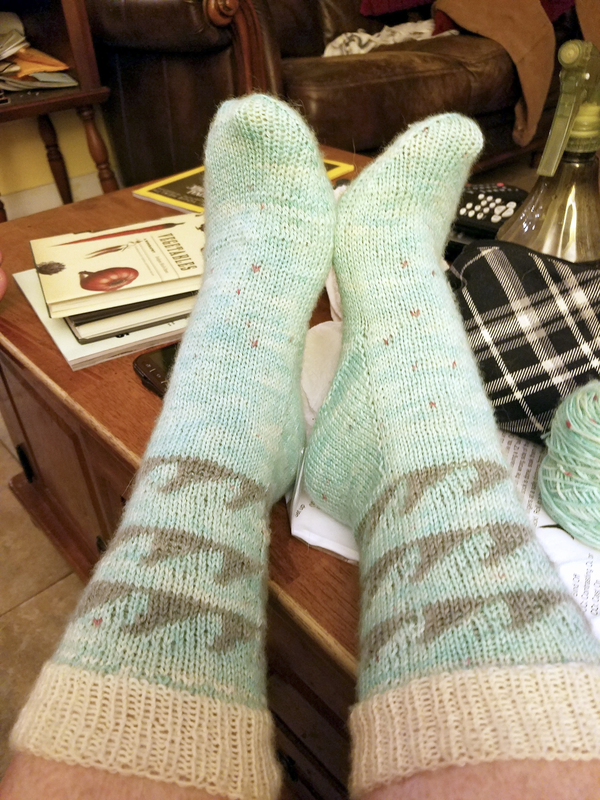 It is with a heavy heart that I must say….I FINISHED THE DAMN SOCKS! Yay!!! I was working on those so long that I felt I was in a bad relationship. Say bye-bye to the shark socks – woohoo! With that out of the way, I could focus entirely on my scarf. 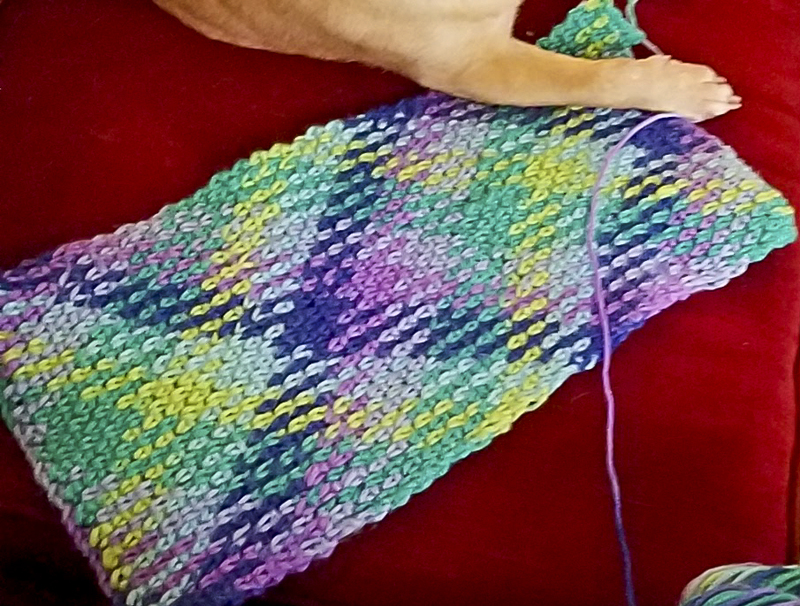 I was so excited to finally work on a pooled crochet project. If you saw my last entry, you know how keen I was to be doing this. It was going to be the prettiest scarf, ever, with tassels and everything. When I finished with the first skein, I was figuring out how to join the two yarns so that the color sequence remained the same, and discovered that in order to make the match, I would have to pull not from the center but the outside. I unwound the factory skein with my yarn winder so the correct end would be used. Ok, so I can be funny that way; I just didn’t want to be pulling from the outside as it always causes trouble later on! 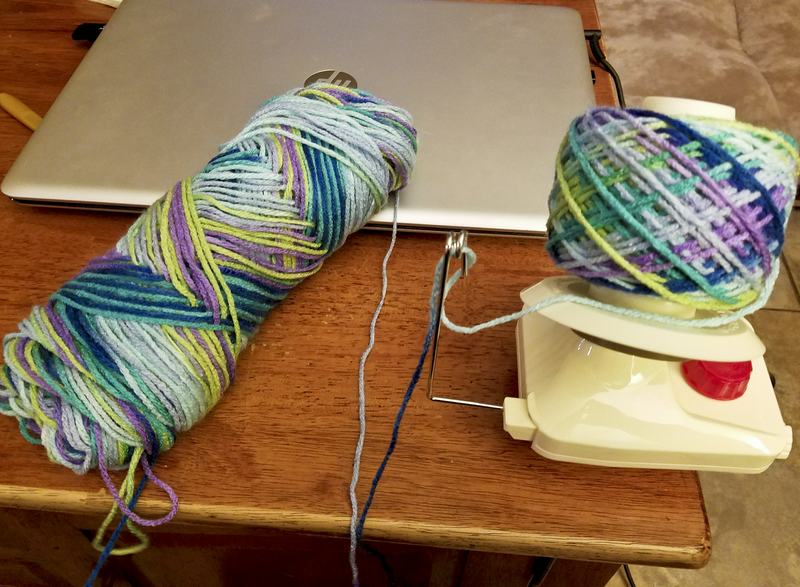 As I successfully joined the yarns, I had to blink my eyes several times because, oh crap, the colors weren’t the same hue. 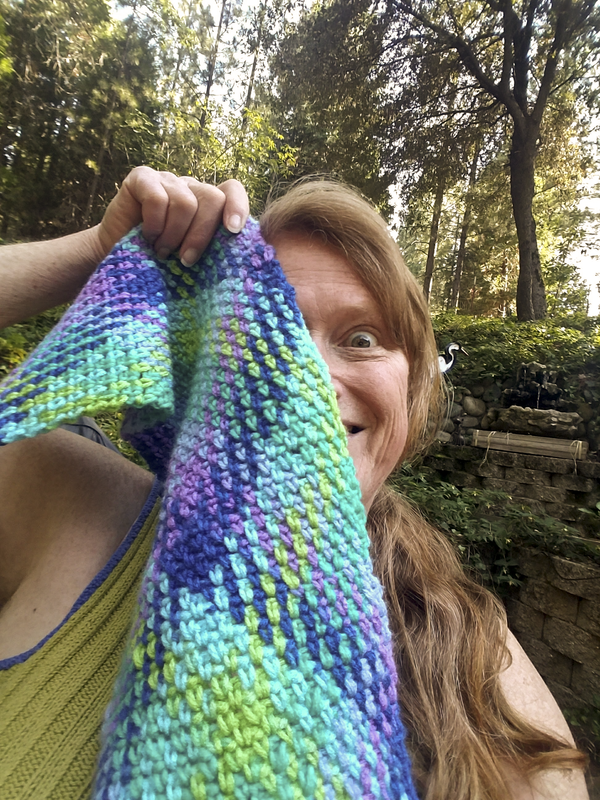 In my haste to begin with this beloved project, I failed to check dye lot numbers. Goody. I had already unwound the new skein, so there was no returning or replacing it. Double goody. What do you do when this happens? 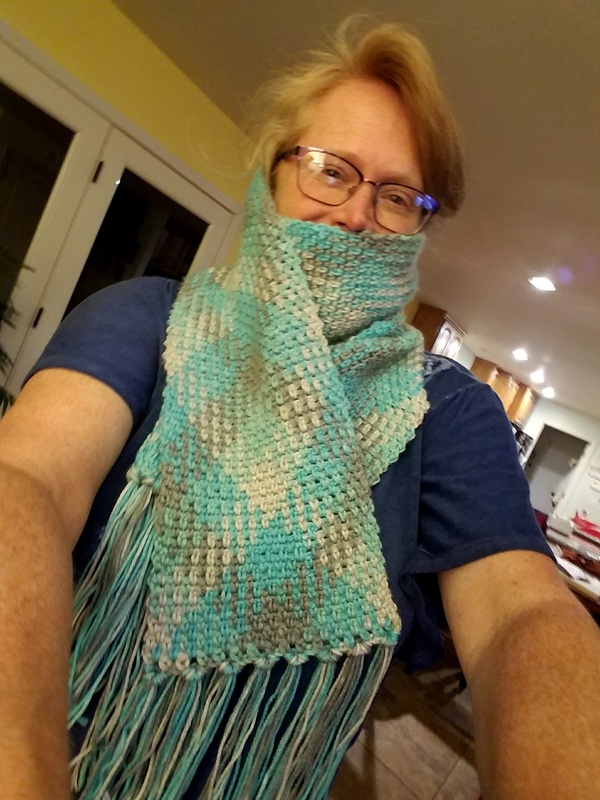 You check how it fits around your neck and make a buttoned cowl, or neck wrap, which was no easy feat considering the pattern I was trying to keep; but, I persevered and got ‘er done! Ta-da! I will be making a scarf next, and I will be checking the dye lots! I will also be using a different technique to see how that goes. I’ll let you all know. In the meantime, behave!